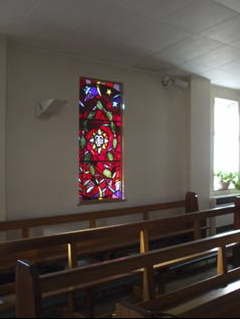 I n Spring 2010, Father Barry contacted me with a view to commissioning a window for the Sacred Heart Chapel window to be situated opposite the Ave Maria window I previously made for the Lady Chapel in 2009. 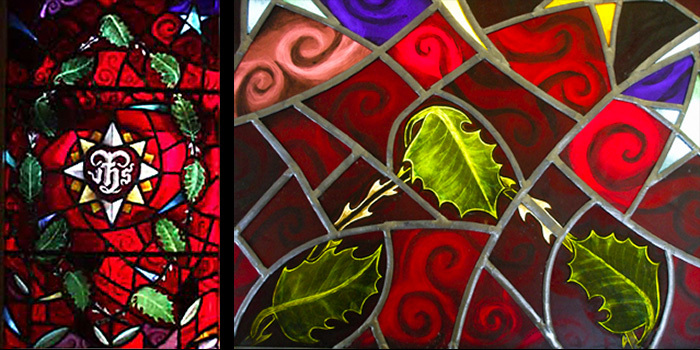 The brief was for a window with a red background and foliage suitable for Christ’s passion. Father Barry suggested the monogram IHS for the central sacred heart motif. This monogram is an abbreviation for the Greek or Latin letters that spelt Christ – IHCOYC. This is commonly abbreviated to IHC/IHS and this is indicated by the short bar on the stem of the H. The encircling rays are formed of a white cross in a yellow star. There are eleven holly leaves to represent the eleven disciples at the crucifixion of Christ. The leaves are deliberately arranged asymmetrically to avoid rigidity in the design. The IHS symbol, as well as the leaves and thorns, are sandblasted onto red flash glass (clear,green or yellow glass with a thin layer of red) then painted. I have added some extra teal green enamel to the leaves to intensify the color. The background is painted with fluid forms and shadows to link it to the altar window that evokes imagery of the sea and the Celtic origins of St. Columba. As the window is in a very sunny position it needed more tonal painting in the background to prevent the transmitted light flooding out and obscuring the major elements. The basic geometry and decorative details of moon and stars follow the same layout as the Ave Maria window. The central almond shaped mandorla acts as a support for the holly leaves and thorns that surround the design and heart is decorated with white thorns. The drawing of the lead line both contains, and energises, a design aiming to reflect the action of Christ’s passion working in the world. It acts as a dynamic counterpart to the reflective calm of the Lady Chapel window. The Sacred Heart Window was completed in November 2011.